As with the failed franchise blockbuster The Mummy (2017) I have once again been to the cinema and watched, not a great film or work of art, but rather a decent bit of popcorn entertainment that has seemingly been critically mauled, not necessarily unfairly, but out of context from the kind of film it is. Don’t get me wrong, there is a lot of Venom (2018) which doesn’t work and the film has a couple of serious plot holes, however, if you watch it as the darkly, comedic action film it is intended to be then it has a lot to offer. I mean, superhero films, over the years, have got – Thor: Ragnarok (2017) and Marvel’s generally witty one-liner littered scripts aside – very serious at times. Most recently, Black Panther (2018) was rooted in familial revenge and of course, Marvel’s Infinity War (2018), ended with an apocalyptic disaster for the Avengers and Earth. While there are serious themes in Venom, the director Ruben Fleischer has gone for more crazed humour rather than serious analysis of the psyche. As such for all its faults Venom actually felt more like an actual comic book or cartoon on screen. So, I get that people may not like the movie for being a bit lacking I think they need to lighten up. Thus, in my second instalment of my occasional series In Defence of:, I’d like to say why I actually found it very watchable genre entertainment. Standing alone, at the time of the action, from the Marvel ‘Universe’ and the recent Spiderman: Homecoming (2017) movie, Venom features the stupendously committed performance of Tom Hardy as crime reporter Eddie Brock. Eddie’s latest case is to delve deeper into uncovering the interplanetary research of Elon Musk-type uber-scientist and corporate mogul, Carlton Drake. Of course, he goes too deep trying to uncover the deadly experimentation and finds himself infected with a space being that Drake has brought back. Drake, compared to the delirious character rendered by Hardy, is a bit flat and another long line of corporate bad guys which Marvel employs and he deserved some better dialogue to justify his megalomaniacal plans. But Riz Ahmed is a great actor and does his best with an under-written role. What works more though is the connection between Brock and his extra-terrestrial host. Perhaps, given this is a Jekyll and Hyde story it should have been a lot more intense. The psychological horror of being absorbed by another being is something David Cronenberg, would have knocked out of the park. Yet here it’s turned into something of a comedy double act; albeit with Venom biting the heads off bad guys in between the insane banter. Tom Hardy’s rat-a-tat spats with his ‘other-half’ are very funny and reminded of another recent film called Upgrade (2018), which combined even more bloody violence within a hosted protagonist narrative. With the cool persona of Michelle Williams, an actor of high artistry, clearly enjoying playing for laughs within the straight romantic lead, there is at least some level-headedness to counter Hardy’s facials ticks and roars. Moreover, despite glaring holes in the narrative including: the very generic alien invasion plot; clichéd corporate mercenaries providing body fodder and a severe lack of legal consequences to Brock’s ‘Venomous’ attacks, the smart comedy, pacey action, the monster-effects of Venom itself and fighting scenes, keep entertainment stakes high. Ultimately, while much more could have been done to explore the dark side of their symbiotic relationship it was unlikely with this director. Indeed, as Fleischer showed with Zombieland (2009) and direction of suburban zombie show Santa Clarita Diet (2017), he favours mixing dark matter with black humour. Lastly, with Tom Hardy as a more than willing ally Fleischer and his army of writers have delivered an admittedly flawed comic-book narrative that remains full of parasitic punch and energy. 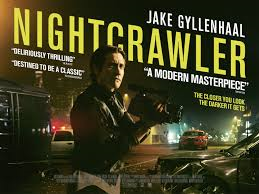 This is a sensational pitch black character piece that allies a powerful script with violent social satire; all glued together by an Oscar-worthy lead performance from the ever-excellent actor Jake Gyllenhaal. It’s about monsters. The monster of ambition. The monster of obsession. The monster of humanity. The monster of the Media. The monster of a bloodthirsty public searching for the next violent clip to trend or share on Twitter or Facebook over their morning coffee. Gyllenthaal plays the main monster: Lou Bloom. He’s an anti-anti-anti-hero of our times. A personification of capitalist evil. Dan Gilroy’s cutting script makes no attempt to make him likeable or even sympathetic. We first meet him stealing scrap metal and beating the crap out of a Security Guard. He then has the balls to try and get a job at the yard he’s selling stolen goods to. So why was I immediately enthralled by Lou Bloom? Well, he has ambition. He has drive. He has linguistic charisma. He has a thirst for success. A thirst for money. And a thirst for blood. Lou Bloom is a vampire – a night creature creeping between the shadows and he finds the perfect vehicle for his nefarious wants. He discovers he can make money filming car wrecks and violent crimes on the streets of Los Angeles and sell them to a local News station. His TV handler Nina (Rene Russo) takes him under her wing but it’s not long before Bloom is taking flight and manipulating her to his own needs. With the smooth patter and greasy complexion of a snake-oil salesmen Bloom extends his operation by taking on down-on-his-luck Rick (Riz Ahmed) and competes on the dark, mean streets of LA with veteran ‘crawler’ Joe Loder (Bill Paxton). Bloom will stop at nothing to achieve his expansion goals. The drama really cranks up as he races to record one gut-churning tragedy after another eventually manufacturing violence to his own gain. These guys are filming and selling death – with echoes of Michael Powell’s classic horror film Peeping Tom (1956) – and WE the voyeuristic public are buying it. I enjoyed the fact that Bloom was a ghost; a shell of a man with little in the way of backstory and yet through his actions we absorb the horror of his character. I was drawn in so much by Gyllenthaal’s magnetic performance as well as a fine supporting cast. Incredibly this is a DEBUT film from respected Hollywood screenwriter Dan Gilroy. However, he directs with aplomb and the end shoot-out and car-chase was a memorable piece of filmmaking – full of tension – with a quite breath-taking pay-off. I loved this film. It takes the idea of the News Media as not merely objective representatives of fact but rather sensationalist manipulators where murder has become a natural by-product of their lust for ratings. Films such as Gone Girl (2014) and Anchorman 2 (2013) have examined darkly and humorously the role of TV News in society recently but the stylish neo-noir Nightcrawler trumps them. Through Bloom the parasitic press and public are shown to both be vampires draining the life out of humanity. WE ARE ALL MONSTERS AT HEART!